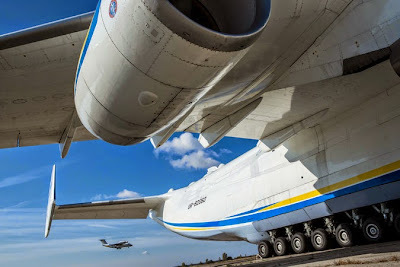 KIEV, Ukraine -- The sprawling campus where the Antonov company once designed and built prototypes of the world’s largest transport aircraft — flying whales whose very bulk symbolized Soviet might — lacks buzz these days. Workhorse of the air - The Antonov-225 Mriya on an airfield in Hostomel, near Kiev. A few derelict airplanes sit along the weed-choked apron connecting its huge construction hangars; cats saunter through the muted assembly shops; flight simulators sit empty. With the rupture, Ukraine, among the world’s top 10 arms exporters, lost the market that spurred the development of its military industry. First, Ukraine inherited flagship industrial plants like Antonov with the disintegration of the Soviet Union in 1991, but neither the government nor the companies tried to reorient sales. Russia remained the primary focus, so this year’s rift set scores of companies adrift. Second, state-run firms never abandoned their love of central planning. Antonov and other companies avoided shattering the Soviet organizational model, still awaiting state requisitions. Even now, experts noted, Antonov is locked in a bitter, paralyzing court battle over which arm of the Ukrainian bureaucracy controls it. “Antonov is Ukraine’s calling card. It built the most powerful transport planes that beat all the world records,” said Valentyn Badrak, an independent Ukrainian military analyst. In the 1980s, two planes — first the Antonov-124 Ruslan and then the even bigger Antonov-225 Mriya — lifted record-breaking cargoes. With their trademark open noses, they have transported rockets and railroad cars and battle tanks. Designed as the Soviet Union waned, only one AN-225 was ever built. While design was done at the Antonov complex in Kiev, production was scattered across the former Soviet Union. Antonov did not start building planes commercially until 2009, when the government merged it with a failing state-run aircraft builder. Lately, though, the company has fallen on hard times. By its own account, Antonov built just four airplanes last year: three small passenger jets for Cubana, Cuba’s national airline, and one for North Korea’s Air Koryo. So far this year, it has delivered only two more small planes to Cuba. Six planes in various stages of construction sit in the vast assembly hangar here, but the company is unsure about buyers for most of them. Despite the slowdown, it still has 13,000 employees of its own, while an estimated 70,000 Ukrainian workers at other factories build parts for it. Antonov was supposed to test a prototype of a new transport plane, the AN-178, in 2014, but has yet to receive the engines, which are made elsewhere in Ukraine. The company would be better off buying engines outside Ukraine, Mr. Badrak and others have said, but powerful business interests blocked that. Antonov employs some impressive engineers who rattle off complicated technical data in fluent English, talking about digital design and composite fuselage materials. Yet the place exudes a certain retrograde air. In the assembly hangar, the black phones on the work tables have rotary dials. Small passenger jets like the AN-148 still sport engines mounted about a yard higher than Western airplanes, to avoid sucking debris off the ground. “Russia, China and Kazakhstan have a lot of not-so-good airfields,” said Viktor N. Kazurov, the project manager for the AN-148, noting the design would be useful for bad runways anywhere. With the signing of a cease-fire in early September, attention is shifting from the war for control of southeastern Ukraine to the country’s economic crisis, which is severe. The economy is expected to shrink by more than 6.5 percent this year, according to the International Monetary Fund, which is keeping Ukraine afloat with an $18 billion loan over the next two years. Yet, at just under 50 percent, government spending as a percentage of gross domestic product is among the highest in the world — and an indication of how far the government has to go to establish something like a free-market economy. Antonov might be considered Exhibit A of the problems Ukraine must overcome. Oleg Antonov, a Russian flight enthusiast, organized an airplane design company owned by the Soviet state in 1946 and directed it until 1984. He had a knack for making hardy passenger planes that could survive crude, often unpaved Soviet airfields. The Soviet government asked him to create military transport planes, and for a time, Antonovs formed the bulk of the fleet. Company officials talk about seeking new markets and cashing in on its high international profile, and some years ago, Antonov did license a plant in Iran to make small passenger jets. But it has been slow to develop new customers, experts said. The defense industries in Russia and Ukraine remained interdependent after the Soviet Union collapsed, and right up until this year, raw materials and manufactured parts flowed back and forth across the border. Ukraine built few wholly independent weapons systems. At this point, Russia and Antonov still could not build planes without the other, experts said. The Kremlin first announced in the 1990s that Russia would produce all military equipment domestically, but it never did. The country received 4 to 7 percent of its military supplies from Ukraine annually. Trade continued unabated this year, even after Russia attacked Ukraine’s Crimea Peninsula. Finally, on June 17, the Ukrainian president, Petro O. Poroshenko, ordered all military sales to Russia halted. In its best year, 2013, Ukraine’s state-run military enterprises sold nearly $2 billion in arms globally, Mr. Badrak said. Russia bought 15 percent, the third-leading customer after China and Pakistan. Sales by private companies added even more. Perhaps most important, Ukraine manufactured critical, technically complex equipment for Russia that cannot be rapidly duplicated — helicopter engines, gas turbine engines for warships and key missile components, as well as Antonov aircraft designs. Yet the Kremlin, Antonov executives say, wanted to maintain ownership of the advanced designs, even though they were developed by the company. The history of the ill-fated Antonov-70 — a four-engine, wide-body military transport plane — illustrated the problem. In development for more than two decades, the plane endured several design phases as Russia asked Antonov repeatedly for changes like more modern avionics. Eventually Russia committed to buying 60 aircraft, and the Ukrainian military ordered two. Production was to be divided between both countries. But disagreements continued to plague the venture, so it was suspended 18 months ago, said Dmytro S. Kiva, 71, the current Antonov president. The root problem was that Russia wanted to own the intellectual property rights for a plane that Antonov designed. “They wanted to control it,” Mr. Kiva said. Critics say Antonov is now on life support, living off the $200 million in revenue earned annually by a subsidiary that leases giant AN-124 transport planes to NATO and other customers. The company conceded that the leasing revenue is important, but said it earned between $300 million and $400 million annually from leasing and other activities, and that trade with Russia accounted for just 10 percent. Antonov still builds civilian aircraft jointly with Russia. What Ukraine really needs, many experts said, is a different mind-set, particularly in the estimated 40 percent of economic production that the state runs. “Many of those old-style managers are unable to accept the reality,” said Pavlo M. Sheremeta, who resigned as Ukraine’s minister of economy in August over the slow pace of reform. Antonov, at a time when experts believe it should be focused on finally escaping its Soviet past, instead captured headlines in September when a president newly appointed by the Ministry of Industrial Planning summoned the police to try to force his way into the plant past employees who liked their current boss and wanted a voice in choosing any new leader. In a management dispute worthy of “Alice in Wonderland,” the company maintains that the Ministry of Industrial Planning — its very name redolent of Soviet ways — cannot appoint a new president because the agency was abolished after the February revolution. The government gave it three months from March to conclude its affairs, but Oleksandr F. Kalenkov, the acting minister, said last month that he needed up to a year to officially hand over the 140 or so companies it runs to the Ministry of Economy. He was removed from his post on Oct. 1. The confrontation now sits in Kiev District Administrative Court. Asked about the dispute, Dmytro Shymkiv, appointed in July to coordinate all government reform efforts, consulted a list of ministries on his tablet. The Ministry of Industrial Planning no longer existed, he confirmed. Mr. Shymkiv then conceded that there might be a gap between the decree and reality. “When you have a transformation like this in the country, you will have a lot of cases like this,” he said. He called Antonov too strategic to privatize. Valeriy V. Migunov, a spry, 78-year-old retired test pilot, still acts as a consultant for Antonov. Wandering among the quiet flight simulators, he waxed nostalgic about past decades, starting in the 1960s, when Antonov’s first wide-bodied transport planes created global buzz. “An ordinary company could not build such aircraft,” said Mr. Migunov, who was named a “Hero of the Soviet Union” in 1984. After some prodding, he acknowledged that he was having trouble accepting that Antonov was severing ties with Russia. “I feel a certain amount of personal discomfort,” he said.